My work has been putting me in the classrooms a lot this year, which makes me happy, and one of the teachers I'm working with gave me the go ahead to revamp her writing wall as we moved into a new unit. I had fun! Help-yourself bulletin boards have been a focus of my work this year, and I developed one for our class. Choice is important for writers, both in terms of topics they use and in terms of tools they have available. Therefore, I created a wall of tools for the students, and hooray! They've been using it! Sometimes they take the checklists which are in the green slots. I made them separate checklists for structure, development, and conventions, and I put one grade on one side and the lower grade on the other side. This way they could be more honest goal-setters. I also wrote continua for them of fair to great paragraphs, and those are in the blue slots. On the left, we have the charts and continua in miniature versions in plastic frames; students can take those during workshop time. I also made miniature versions on card stock which students have been using and returning. 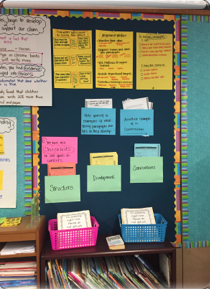 It's been fun to watch them make decisions about which tools will be most useful to them on that day, and I also think it really reinforces the concepts of goal-setting and intentionality which are so important in our lives as writers. I am a firm believer in making purposeful and useful bulletin boards. These are great! So well thought out and helpful so that the kids take responsibility for much of their learning. Thanks for sharing. Melanie, you are creating a sense of agency in the classroom with your help yourself bulletin boards. I hope more people visit your post today so they can pick up this idea. Some great ideas here . . . Making me think. I imagine there will be many teachers who will want to know more, Melanie.This looks great for students, and a big help for teachers!